In my blog post Week 5: 47 to go, I spoke about my colleague Emma. During that week, a 3 day tube strike was planned for zones 1 and 2. Everyone at work, along with 8 million other Londoners, were trying to figure out how to get to and from work during the strike. So I suggested lending me bike to Emma for her to be able to travel around. The next day I brought my spare bike in for her, along with some other items, a high-viz jacket, and another colleague lent her a helmet and some lights. Emma did a great job with her first few rides, loved it and even said so herself, she thinks she’s now going to become a cyclist! Find out about more about Emma and her first rides in this guest blog. I’m Emma. A London and Tooting enthusiast. 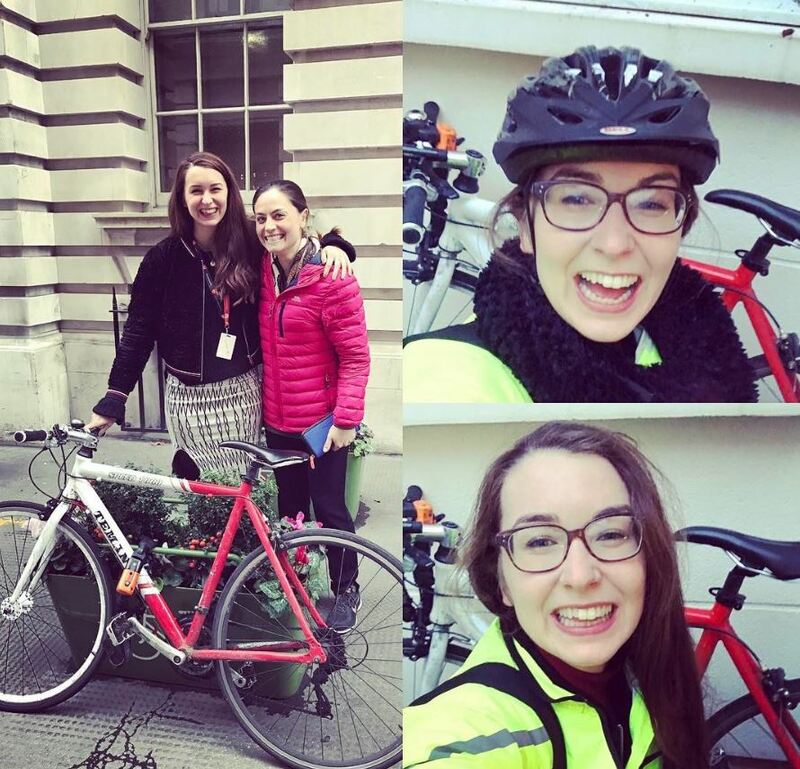 I’m 24, pretty active and believe in all things active, but never plucked up the courage to get into cycling in London. I work at London Sport with Mieke, forever surrounded by people who are doing their thing to power themselves. But I lacked the final nudge and courage to give the bike a go. What stopped you from getting into cycling before? My mum. No, that’s not all true. But her concern over my safety made me question my own safety. You commonly hear of horror stories. They are what make the press rather than the hundreds (thousands?) of people that get so much from cycling. There are risks to everything right, why should the over exaggerated safety risk of cycling in the capital stop me? I had been toying with the idea for a while and set myself the aim of starting in spring once it got lighter and warmer, so I had fewer excuses. But then the tube strike came around and the idea of spending 4 hours between buses each day was not appealing. That’s where Mieke stepped in and announced her spare bike. The rest is history… (not quite but I’ve made the first plunge). How did you find your first ride? 3. Would my unstable hungover state tip me off balance and onto the road? Answers: No! I am still alive to tell the tale. I arrived home, fall free and full of adrenaline and exhilaration. I had made it! Cue sending Mieke countless selfies and Instagram uploads, I was proud. What advice would you give to others thinking of cycling for the first time? Tell fellow cyclists. I was overwhelmed by the support I received. From the bike that Mieke lent me, to lights and a helmet from my manager and then came 2 fellow South West London colleagues happy and willing to accompany me on my cycle commute. They encouraged and supported me, reinforcing that I was doing something good, for me and the exercise endorphins, for my bank balance and of course, for the environment and clearing up that 1 space on the tube. What’s bad/good about cycling in London? It is busy. There are lots of buses, taxis and cyclists. Coming from the countryside, where it is rare to see anything but a cow on the roads, London lanes are intimidating. But equally, because of the number of people here, there are herds of passionate cyclists who not only view cycling as active travel, but also a form of leisure and escape. There are many cycle superhighways set up and it’s only getting better. There are alternative quieter routes that can be taken, and even if they’re slightly slower, it’s still quicker and more pleasurable than a smelly, sweaty and sticky the tube. As much as I haven’t yet integrated it into my routine and I’ve still got a while to go before the nerves fade, it just makes sense. I love being active, I love saving money, and I care for the environment. There are more reasons to do it than there are against it. Yes, there are risks. But anything with a decent reward always runs a risk. Powered by Me is an adventure for an entire year getting from a to b, powered only by myself cycling, running or walking and fundraising/blogging/vlogging along the way. If you feel inspired by my my challenge, please donate to City Harvest London, a fantastic charity that rescues food for the hungry and is helping our mega city to be a better place to live. Hey great post! I hope it’s ok that I shared it on my Facebook, if not, no worries just tell me and I’ll remove it. No worries at all, thanks!